Hunters rest on the ice during spring seal hunting; they have planted their gaffs to support grass mats as a windbreak. 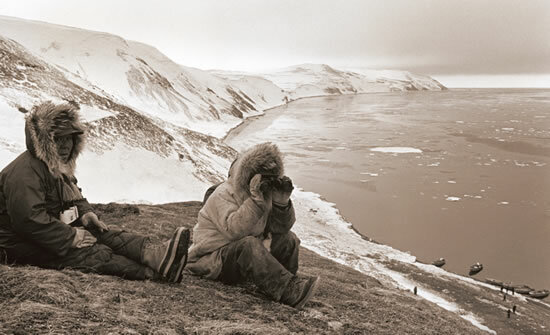 John Abraham and Gerge Chimiugak, Toksook Bay seal hunters, study ice conditions. The Yup'ik people have no word for science, yet their tools were so well designed that they allowed the Yupiit to live in a land no one else would inhabit. The exhibition Yuungnaqpiallerput/The Way We Genuinely Live: Masterworks of Yup'ik Science and Survival presents remarkable 19th and 20th century tools, containers, weapons, watercraft, and clothing in an exploration of the scientific principles and processes that have allowed the Yup'ik people to survive in the sub-arctic tundra of the Bering Sea coast. Not just a science exhibit, Yuungnaqpiallerput is compelling in its presentation of the unique marriage between art, science and ethnography. At the exhibition's core is the recognition that the Yup'ik way of life--both past and present--is grounded in deep spiritual values and scientific principles. A team of Yup'ik elders and educators determined the exhibition title and design, which takes visitors through the seasonal cycle of activities showcasing tools and materials. Featuring masterworks ranging from a needle made from a squirrel bone to elegant bentwood hats, Yuungnaqpiallerput draws more than 200 objects from the collections of 13 museums in the United States and Germany. These pieces are the legacy of the intelligence and ingenuity of the Yup'ik people and illustrate their intimate relationship with their environment. 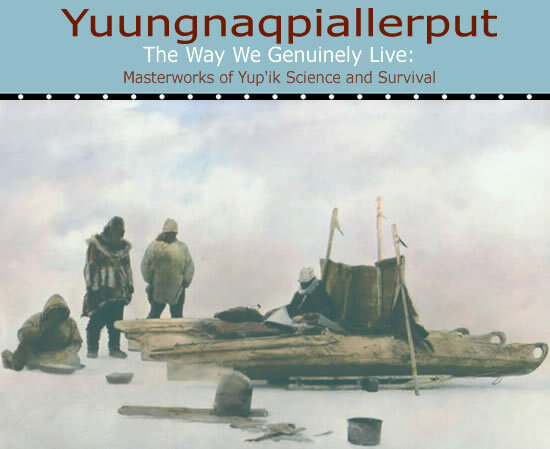 Yuungnaqpiallerput tells us something about Yup'ik tools and technology in the past. Much more important, it teaches about what it means to be Yup'ik today. It does so thanks to the talent and generosity of spirit of the many Yup'ik elders and educators who shared their knowledge. The exhibit began with their desire to bring things from museum collections home for young people to see, and this is what has made it strong. Yuungnaqpiallerput was made possible by a unique collaboration between the Anchorage Museum and the Calista Elders Council. The Calista Elders Council, especially translators Alice Rearden and Marie Meade, have worked tirelessly for years documenting Yup'ik traditional knowledge. The Anchorage Museum contributed their experience and expertise to mount this unique exhibit. Putting our strengths together, we have created something neither could do alone. Finally, moving through the exhibit, you will read and hear the voices of elders who shared their knowledge. They did not do so for fame or fortune, but because of their love and compassion for us all, and their strong desire that their words help us all live better lives.